(1870, St. Petersburg–1960, Paris) an influential artist, art critic, historian, preservationist, and founding member of Mir iskusstva. His influence on the modern ballet and stage design is considered seminal. He, Sergey Diaghilev and Lev Bakst founded the art magazine "Mir Iskusstva" which aimed at promoting Art Nouveau in Russia. In 1901, Benois was appointed scenic director of the Mariinskiy Theatre. 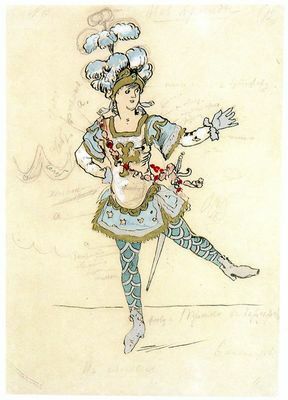 Since then, he devoted most of his time to stage design and décor, collaborated with the Moscow Art Theatre and other notable theatres of Europe. From 1918 to 1926, he ran the gallery of Old Masters in the Hermitage Museum. His Memoirs were published in two volumes in 1955.